Above all, Archaeology at Nottingham has always been a friendly and welcoming department in which staff and students form a community, sharing a common enthusiasm for the past, whether it be centred upon the origins of human culture, prehistory, the Greek and Roman world, the Dark Ages or the medieval period. Students (undergraduates and postgraduates) are encouraged to develop their own specialist interests, to be involved in the research and field projects carried out by staff, and to study in the relaxed and informal atmosphere which is so much a part of the department’s character. and to be involved in the research and field projects carried out by staff. 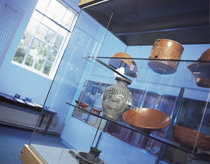 The newly rebuilt University Museum is located in the building with the Department of Archaeology and is a centre for research, notably a current programme researching our world famous Oswald Collection of Samian pottery.